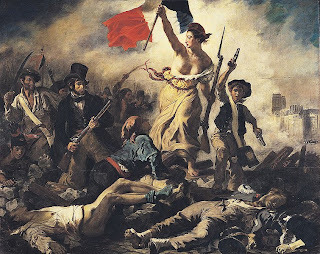 This painting, more than anything, is Delacroix commemorating the French Revolution (1830). A woman who represents Liberty leads the her followers forward despite the dead bodies. She holds a musket in one hand, and the French Revolution flag in the other. There is also a wide representation of social class in this painting (Upper=Man with top hat, Mid=Boy holding two pistols, etc), showing the united nation. The central figure represents an allegorical goddess figure and the female population. Liberty is shown striding over the enemy on the "pedestal" of dead bodies. The most obvious formal element is the strength of Liberty shown with a triangular composition, with the strongest most important figure at the peak in the center of the composition. This image truly captures a sense of triumph with the imagery of the figures, dead bodies, and debris in the background. The figures in the foreground tend to pop due to their contrast in comparison to the background. By capturing this strong sense of pride and awe, Delacroix truly captures the essence of Romanticism.